Hardware keyboards on modern smartphones are an increasingly rare sight, but as proven by a new... color of an existing BlackBerry design, they're not entirely dead yet. Interestingly, perhaps the most ambitious such retro-style product doesn't come from the TCL-revived brand or the "new Nokia", the latter of which focused its nostalgia in a much lower price bracket over the past couple of years. The company that's basically trying to adapt a form factor reminiscent of 2007's HTC Shift to a new era of mobile computing is called F(x)tec. Don't worry, it's perfectly fine if the name rings absolutely no bells. The first time we heard about this startup's unique vision was last month, and lo and behold, pre-orders are already underway for a device dubbed simply the Pro1. This bad boy still needs a little time before it can reach its earliest adopters, which doesn't seem ideal considering the F(x)tec Pro1 packs an already-outdated Snapdragon 835 processor. On the bright side, not only is the phone slated to run Android 9.0 Pie out the box when it launches in July, also promising to come pre-loaded with a number of landscape-optimized apps, including a proprietary email client and calendar. A sliding physical keyboard with a full 64-key landscape layout is undoubtedly the key (no pun intended) selling point of the Pro1, arguably eclipsing the versatility and convenience of the BlackBerry KEY2 or even the BlackBerry Priv from a few years back. When whipped out from under the screen using a hinge mechanism billed as more robust and solid than a "regular" slider, the keyboard creates a 155-degree angle in combination with the 6-inch panel. The angled FHD+ (2160 x 1080) AMOLED display should provide an "optimal typing and viewing experience", enhancing both productivity and the content consumption experience. Of course, you're always free to watch videos with the QWERTY keyboard out of sight, and a 6GB RAM/128GB internal storage combo means this is hardly a pushover when it comes to multitasking or digital hoarding. The rest of the specifications are not exactly impressive by today's high-end standards, including a 3,200 mAh battery, dual 12 + 5MP rear-facing cameras, a single 8MP selfie shooter with f/2.0 aperture, dual nano SIM/microSD card support, USB Type-C connectivity, and a side-mounted fingerprint sensor. It's pretty obvious that the F(x)tec Pro1 is by no means a conventional 2019 high-ender. Unfortunately, it's almost as expensive as one, fetching $649 in a GSM and CDMA-compatible variant that supports "the majority of carriers in Europe and North America." That's not as pricey as the Galaxy S10 or even the Galaxy S10e, but it's more expensive than a top-tier OnePlus 6T configuration with 8 gigs of memory and 256GB storage space. If it makes you feel any better, F(x)tec actually evolved from the Livermorium project, which originally envisioned a Keyboard Mod for Moto Z-series handsets. Thus, the company is not entirely new or obscure, although the keyboard-attaching smartphone accessory never materialized. This time is different, according to F(x)tec, which highlights the small outfit's goal of "bringing back what's missing and making it better." So, were you missing a slide-out hardware keyboard? Does anyone have any intention of pre-ordering the Pro1 at $649? Before you answer, you may also want to consider a couple of pre-order gifts purportedly valued at a combined 30 bucks. Namely, a pair of "limited edition" earphones and a Pro1 case. That's... not much, but it's certainly better than nothing. Finally, it's interesting to point out the hybrid handset is launching to the public in a traditional manner rather than going through a crowdfunding phase first. That proves the company's trust in this modernized retro design. Me too. I can see people buying this phone. I hope it does well. And the SD835 is still a beast. Just because it's a couple of years old doesn't diminish it's capabilities. nokia/hmd should bring back Nokia N950 to life..
Its two years old. Yes, it's outdated. Is it still capable? Absolutely. But those are two different things. Yeah my backup phone the Essential works great for having a year old proc. But I can definitely see a difference between that and my LG G7 speed wise. As an emulator enthusiast, my 835 Note8 isn't up to the task for a bulk of games. But besides that, it's still very capable in most all other functions. This makes me miss my HTC G2. By far the best physical keyboard implementation I've used. One of my favorite phones also. Sadly though, it seems that modern smartphone guts can't fit in that small of a form-factor. Even modern "compact" phones are larger now. But yeah, besides the awesome keyboard and one-handed slide action, the G2 was just a nice phone. Interesting. I wonder, who owns this company. 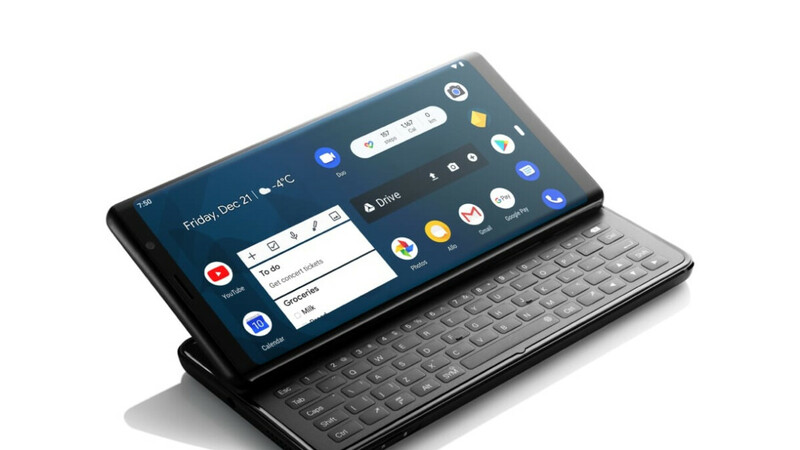 Good for them, it's getting alot of positive review, very Blackberry meets Note 8 without the spen and expensive features. Reminds me of the HTC Tilt/Tilt2 which I loved! Even this many years on, the on screen keyboard for me isn't as good as a good ole fashion hardware keyboard. Nice to see someone bring back this form factor again. But a smartphone is more than just a design, what about warranty? build quality? software update? camera quality? etc.. I do hope this phone (and this company) do well, so bigger companies will try to make something similar, something that I could consider getting one. I'd consider buying this if I was familiar with the brand to see support and lifecycle of their devices and knew it would work on Verizon. Definitely think if a big name brought this form factor back it could be successful. Have one on order, looking forward to it. I would love to have this phone if they bring the price down to $600 or $550... I was interested in this onehttps://www.techdue.com/nokia-communicator-has-a-successor-coming-but-its-not-from-nokia/ but this slider phone looks much sleeker plus it has a Snapdragon 835. Yes that's a two years old processor but it serves the purpose of what this phone is all about. It's a business oriented phone, gaming is not its primary purpose. This has decent internals for the design, but I'd almost rather have the Planet Computers Cosmo Communicator currently sitting at $80 less in price, even though it goes from old-but-high-end Qualcomm silicon to high-end MediaTek silicon. I prefer the design/form-factor of the Cosmo Communicator by far... https://www.indiegogo.com/projects/cosmo-communicator#/ Now, I would just need somebody to put a Qualcomm Snapdragon 439 in something with the same form-factor, sell it for $399, and I'd be good.